1. 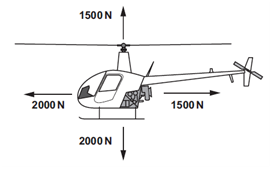 The diagram shows a helicopter in the air. The arrows show the directions of the four forces which can act on it. 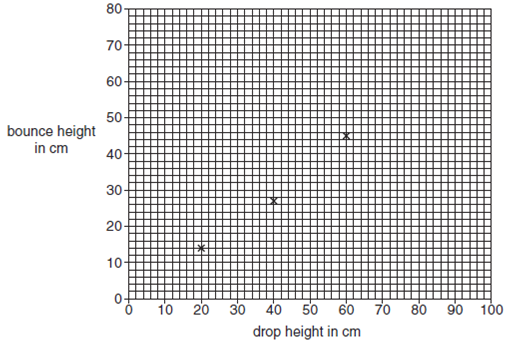 (a) Two of the forces must be equal for the helicopter to stay at the same height. The next diagram shows the sizes of the four forces at a different stage in its flight. (c) The helicopter is now on the ground and the engine is turned off. It is on level ground and there is no wind blowing. 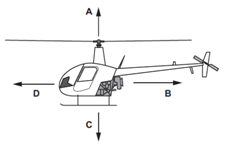 The next diagram shows the direction of one force, C, acting on the helicopter. (i) Write down the name given to force C.
(ii) One other force is acting on the helicopter when it is on the ground. 2. 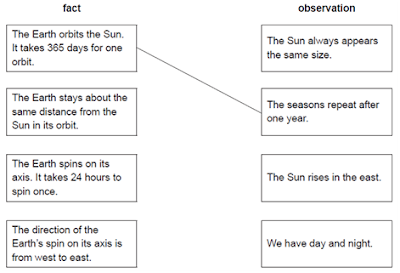 The boxes show some facts about the Earth’s movement and some observations. 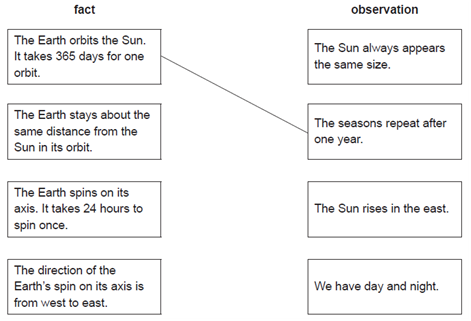 (a) Draw a line from each fact to match its observation. 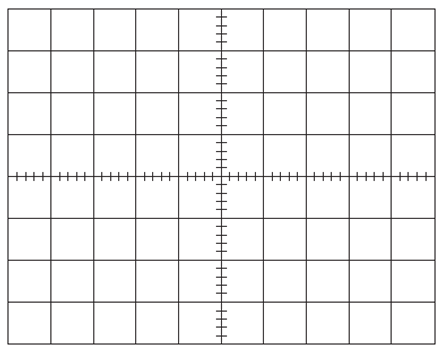 (b) Tick (√) one box next to the planet that can never be seen in the sky all night. 3. This is a question about fuels. (a) Name three fossil fuels. (b) Write down one disadvantage of burning fossil fuels. (c) Wood is a type of biomass which can be used as fuel. What is meant by the term biomass? (d) Wood is also a renewable fuel. What is meant by the term renewable? (e) State one disadvantage to the environment of cutting down trees to get wood for fuel? 4. Simran has been measuring the time taken for different objects to slide down a ramp. The picture shows the ramp with one of the objects, a pencil case, on it. 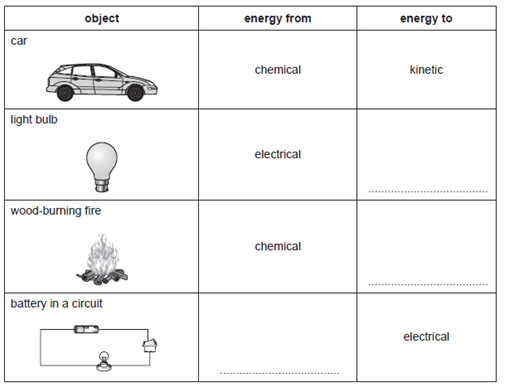 (b) When timing the different objects, the test should be made fair. One factor to keep constant is the distance that the object slides. State two other factors which need to be kept the same for each test. Simran repeats the test with the pencil case and records the results in this table. She thinks there may be something wrong with her second time. (c) Why might she think this? (d) How could she check if the second time was wrong? (a) Measuring cylinder in cm3. 6. 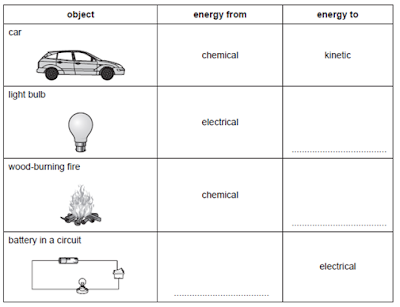 Complete the table to show the useful energy transfer that happens in each case. 7. Liz and Rena investigate how high a ball bounces. They use a metre ruler and a tennis ball. Liz drops the ball from different heights. Rena watches and records the height of the first bounce. 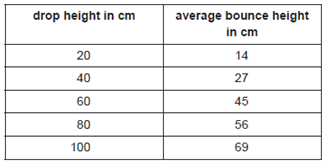 They measure the height from the bottom of the ball. 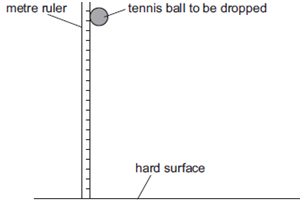 (a) Write down one reason why Rena will find it difficult to record the height of the bounce accurately. Liz and Rena repeat each test three times and work out the average for each. They measure in centimetres (cm). They record their results in the table below. They have plotted three of their results on a graph. • drawing a best fit straight line. Write down one other advantage of displaying results in a graph. (d) Another group in the class does the test. They plotted their results on a similar graph. Their points were all far from their line. What does this suggest about their results? 8. Andy and James are pulling on a rope. The size and direction of their pulling forces are shown. (a) The rope does not move toward Andy or James. Explain why the rope does not move. (b) Andy keeps pulling with the same force of 100 N.
The rope now starts to move towards him. What must have happened to the pulling force from James? 9. 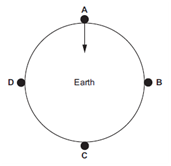 The diagram shows four large objects, A to D, at different places on the Earth’s surface. 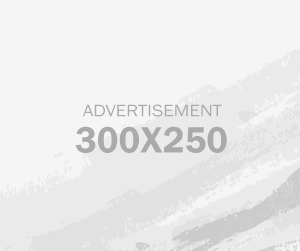 (a) Draw arrows from the objects to show the force of gravity on them. (b) The Moon has a smaller force of gravity than the Earth. Use this information to complete the sentences. Use the words from the list below. The mass of object A will be ..................................... when placed on the Moon. The weight of object A will be ...................................... when placed on the Moon. 10. Brigitte plays a musical instrument called a saxophone. Her teacher asks her to explain the sound the saxophone makes. (a) Complete the sentences that Brigitte writes. Choose from the following words. Sound is a type of .......................................................................................................... .
(b) Brigitte plays a note on her saxophone. 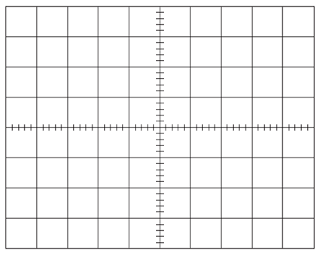 The diagram shows the pattern the note makes on the oscilloscope. Here are some oscilloscope pictures of different notes from Brigitte’s saxophone. (i) Which note has the highest pitch? (ii) Which note is the loudest? (iii) Brigitte plays one note quietly and then makes this note louder. Draw the oscilloscope picture you would see. 11. Bruce compares the speeds of some toys down a ramp. Here is the equipment he uses. He places each toy on the start line and then lets the toy go. (a) Bruce keeps some variables the same. Write down two variables he keeps the same. (ii) Work out the average speed of the toy truck. Include the correct units in your answer.